Ihakara Tukumaru (top) was born about 1813 in the Waikato. He lived temporarily in Hawke's Bay and Otaki. About 1835 the Patukohuru people settled along the Manawatu River. Influenced by the Missionaries Octavius Hadfield (Anglican) and James Duncan (Presbyterian), Ihakara is credited with two houses of worship - the first erected at Te Awahou (sited near the Ihakara Gardens) and the second at Matakarapa in 1880, named "Te Upiri" (the Jubilee) commemorating 40 years of Christianity in the Manawatu. Ihakara was the Native Assessor assisting the resident magistrate (1852 - 1881) and sold 4 acres to settlers' representative T U Cook for 5 pounds for use as a school (1857). He also sold the Awahou Block (37,000 acres) and the Rangitikei/Manawatu Block (240,000 acres) to the Government. 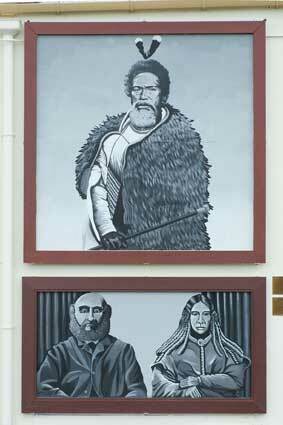 He acted as peacemaker in the wars between Maori and Pakeha and negotiated peaceful land settlements between Ngati Raukawa and other tribes. He died 18th January 1881 and was buried in the old Te Awahou Cemetary. A respected chief, he was mourned by both Maori and Pakeha. Thomas Cook, frequently referred to as "The Father of Foxton" was born in Hammersmith, London in 1816. In 1839 he left London on the ship "Adelaide" eventually arriving in Wellington. After living in the Hutt, he moved to the Manawatu and about 1842 settled at Paiaka where he bought flax fibre from the Maori as well as transporting timber and produce. In 1850 he married Te Akau Meretini, the step-granddaughter of Te Rauparaha. They had a family of ten children. Cook was a man of foresight. After moving to Te Awahou he built a house, store, wharf and hotel. He became the first postmaster and leased the tramway venture from the Government. He involved himself in local affairs being a J.P., a Racing Club Trustee, a Harbour Board Member and Borough Councillor as well as teaching young peolpe music.